If we can afford it, we normally want a comfortable, artistic house surrounded by a lovely large garden facing a scenic view, preferable the Nature. Although the people in the interiors of Papua, Togean Islands, and Lore Lindu can afford it—their customary lands are large enough and wood material is abundant for building such an ideal home—they choose to live in small, ugly houses in a crowded village. 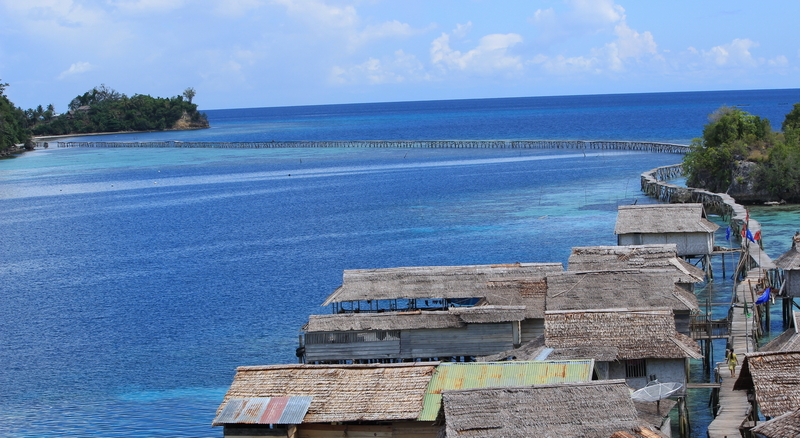 The Togean people, especially the Bajo, are even odder: living on the ocean. Why do they do so? Culture and history might be the answer, but I see some practical benefit of living on the ocean. When we have nothing to eat accompanying rice, we just grab a fishing pole or spread a fishnet and sit in front or at the back of our stilt house. Within less than an hour—in the past—the Togean people would get enough fish to grill. The other benefit is they do not have to build a toilet with latrine. A hole between floor planks will be sufficient for both pee and poo. This activity could be fun because we can watch many colorful fish racing for our organic pellets at the diving point: an efficient recycle of food. And, for that natural recycle, I have no appetite for snorkeling in the water near the villages of the Bajo. The most interesting Bajo village is Plank Island—about 15-minute rowing from Lestari Cottages of Malenge. It is a real rocky island, but the row houses are connected each other by pieces of planks—many are rotten or chipped, some are moving on stepped. These rows of planks connect the Island to Malenge Island passing two little rocks (see the photo). The population is about 1000, I believe. I visited this island a few times for catching the phone signal at the top of the rock behind the village. The Government just installed a pipe system from one spring on Malenge Island through the sea floor. I am sure it will not last long because it was poorly set and has no maintenance. When it is broken, like the one in Tangkian, the people will fetch the fresh water in buckets and plastic drums by canoe, back to the old way.